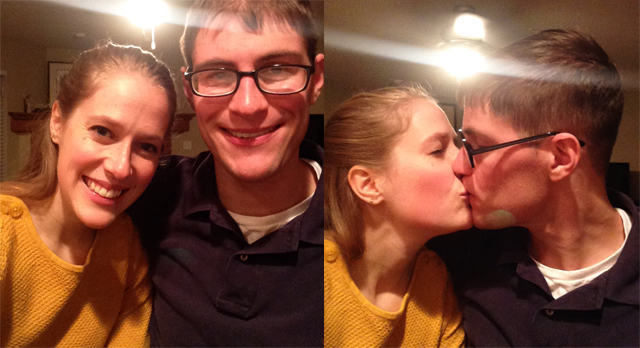 T.J. and I have been enjoying time just the two of us out in our home. And we're getting a taste of what it will be like to be "roommates" come January. I got out here last Sunday for a two week stay. It was perfect timing as I was able to have both my car and all my stuff from the East coast delivered on Monday while T.J. was at work. I spent the rest of the afternoon listening to my ipod and unpacking the kitchen and living room so we would have all we needed come Thanksgiving. T.J. was pretty impressed with my progress... until he saw the upstairs hah. Also our garage is a hoarders paradise but we're plowing through. We've had an interesting past couple of months. Without going into too much detail, let's just say T.J.'s right eye has been giving us some grief so I've been getting acquainted with the army hospital where he works, and is lately sometimes a patient. Needless to say it was not exactly the Thanksgiving you could plan for. But oh, did it remind me to be thankful. I'm thankful that I was out here with him and not on the other side of the country worrying. I am thankful for our health which we so often take for granted. I'm thankful that I was still able to find a turkey late Wednesday night after another crazy day. I'm thankful that instant tapioca is a substitute for (the sold out) cornstarch so I could still make corn pudding. Did you know that? I'm thankful that we were still able to relax most of Thursday and still have the meal I had pictured and that my mom had taught me to make. I am thankful that God is good and He is in control. Even during the unexpected and the confusing moments where we don't understand why or what's going to happen, He is there. I am thankful that T.J. and I have each other. That we will support one another during those hard moments and celebrate together in the after moments. 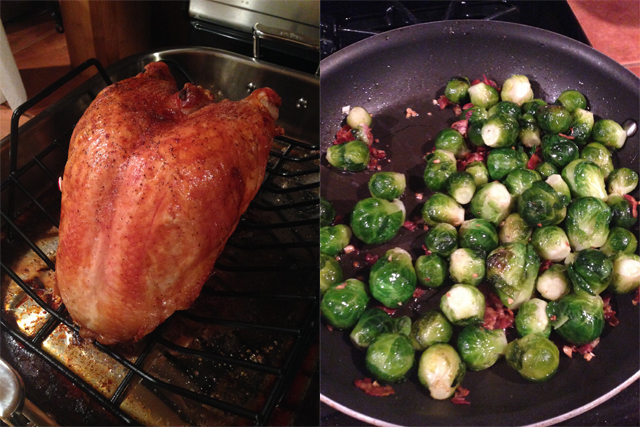 I was reminded that what's important is not the perfect meal cooked in the perfect kitchen in the brand new roasting pan (though I have to admit I was pretty darn proud of my first Thanksgiving dinner). What's important is that T.J. and I take care of each other, love each other, laugh together, pray together. We'll make plans together and when those plans get thrown a curveball we'll hold hands and move through it together. Your meal looks wonderful! Can't wait for your wedding!! Your Thanksgiving meal looks perfect!! Wishing you both a wonderful life together! Great post. Love. This post made me smile, just so enjoy seeing two folks "doing love right." God's richest blessings to you and TJ!